Lua error in Module:Location_map at line 488: Unable to find the specified location map definition: "Module:Location map/data/Hawaii" does not exist. Hawaiʻi Volcanoes National Park is a national park in the U.S. state and island of Hawaii. It is a UNESCO World Heritage Site. The park was created in 1916. It includes The Mauna Loa, which is the Earth's biggest volcano, and Kilauea, the Earth's most active volcano. The park shows the results of millions of years of volcanism, and evolution. These processes produce bare land from the sea, and with complex and unique ecosystems, a distinct Ancient Hawaiian culture. Kīlauea, one of the world's most active volcanoes, and Mauna Loa is the biggest, it offers scientists with insights on the birth of the Hawaiian Islands, and can give visitors views of the dramatic volcanic landscapes. ↑ "Listing of acreage as of December 31, 2011" (PDF). Land Resource Division, National Park Service. Retrieved 2012-03-07. ↑ "Five Year Annual Recreation Visits Report". Public Use Statistic Office, National Park Service. Retrieved 2018-02-26. 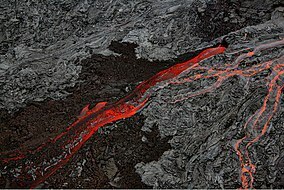 ↑ UNESCO, "Hawaii Volcanoes National Park"; retrieved 2012-4-19. ↑ "Hawai'i's Only World Heritage Site". Hawai'i Volcanoes National Park web site. National Park Service. Retrieved 2009-12-02. ↑ Explosive eruption in Halemaʻumaʻu Crater, Kilauea Volcano. ↑ "Closed Areas". Hawai'i Volcanoes National Park web site. National Park Service. Retrieved 2009-12-02. This page was last changed on 2 September 2018, at 04:30.